It’s always been about the smile for Chris Boerner. At age 14, as a freshman in high school, she stopped being able to smile. It took 10 years for her to recover her smile. 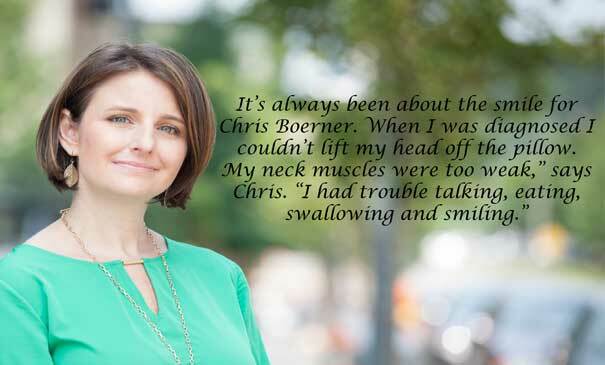 Chris was diagnosed with myasthenia gravis (MG), an autoimmune disease that occurs when the immune system attacks the body’s connection between nerve and muscle. MG causes weakness in the muscles that control the eyes, face, neck and limbs. People with MG may have difficulty with partial paralysis of eye movements, double vision and droopy eyelids, as well as weakness and fatigue in the neck and jaws. They may experience problems in chewing, talking, swallowing, breathing and holding up their head. MG may also affect people’s arms and legs. Chris had surgery to remove her thymus gland, and they told her it may in time allow her to smile. Ten years after her surgery she could smile again, and her medications eventually kept her disease under control. She now has a lot to smile about. She’s married and has two young children. She was a leader at Starbucks in strategy and marketing, but about three years ago she decided she wanted to produce something to connect with people. She remembered how her dad gave her a pill holder that she treasured for many years. It made her feel confident. Chris developed a pill holder in several fashionable styles and launched her company, Cielo Pill Holders. She will soon be featured in an Amazon Exclusives video.